Several years ago I led a labyrinth walk on September 11, in memory of the World Trade Center Disaster. It was held in the churches outdoor labyrinth and the day was perfect for walking. I placed two baskets at the entrance of the labyrinth, one held fallen leaves to represent those who had died that day and the second held small river stones to represent the courage of all of the emergency people who responded to the attack. Each walker was to carry leaf and stone into the center. They were asked to leave the leaf either in the center or place it along the path of the labyrinth. The stone was theirs to keep in remembrance of the walk. The walk was open to the public and was well attended. One young woman came near the end of the walk and I remember her because she was unsure as to whether she would walk or not. Finally she picked up a leaf and stone and entered the labyrinth. As soon as she entered tears started to roll down cheeks, she walk very slowly stopping at each of the stone benches to sit for few minutes. When she reached the center she sat down on the bench and bent over appearing to be either in pain or great distress. I thought about going to see if she needed help but changed my mind and waited. She must have sat there for 15 to 20 minutes before she stood up, carefully placed her leaf on bench and walked out of the labyrinth. When she exited she came over to me to apologize for taking so long and I told her that it was quite alright. She said she had read of the walk in the newspaper and that she really wanted to be here today. You see, her sister worked in the World Trade Center and died that day. At the time she was also living and working in New York and when she heard that plane had crashed to the towers she had run out and saw the towers collapse. They never found any remains of her sister. She told me she hadn’t realized how much grieving she still had to do and that the walk had been more painful than she thought it would be, but she was glad she walked. I told her the labyrinth was always open to the public and she was free to walk it at anytime. I also gave her the names of a couple of Pastoral Counselors she could call if she needed to talk to someone. She left clutching her small stone. Fortunately all labyrinth walks are as dramatic as this young woman’s. Most, if not all, are walks that draw us into a quiet place and provide space for conversation with God. Yes revelations can occur but they are very rare. It is a blessing just to have a quiet walk that brings some peace and serenity to your life. That’s plenty I think. If you’ve never walked a labyrinth here is some historical information. 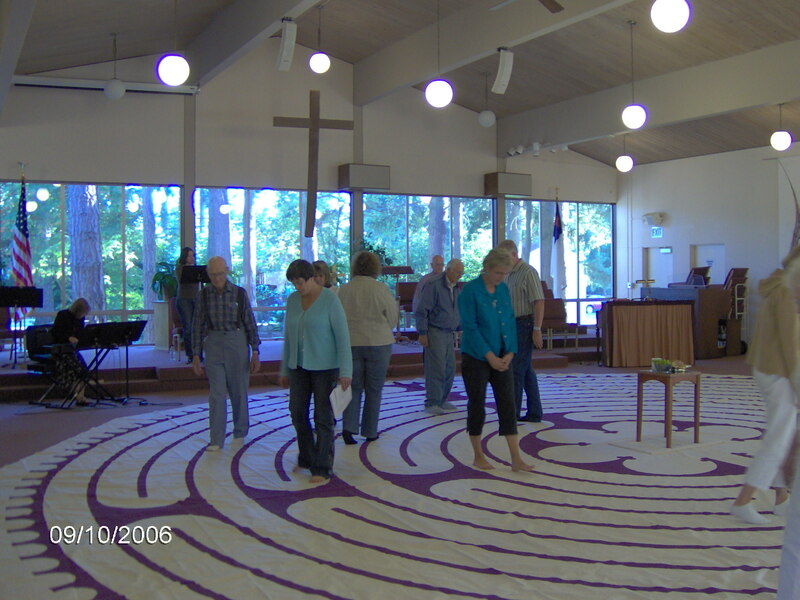 Labyrinths are an ancient meditation tool that predates Christianity. Up until the end of the middle ages they were use in place of a pilgrimage to Jerusalem. People walked the labyrinths sometimes on hand and knees to simulate the difficulties of a long journey. Around the middle of the 1400’s labyrinths fell out of favor and it wasn’t until the middle of the 20th century that they were “rediscovered” as a meditation tool. They are now very popular and used by those striving for deeper spirituality and also in the health professions where the health benefits of walking the labyrinth have proven to be quite diverse. The spiritual practice I am recommending this week to walk a labyrinth. You may locate labyrinth in area that you may walk, or you may “walk” a labyrinth with your finger using a printed labyrinth figure or finger labyrinth made of wood, stone, or metal. The labyrinth has only one path. It diﬀers from a maze in that there are no tricks to it. From early on within the Christian tradition to now, countless people have walked labyrinths as devoted acts of pilgrimage, prayer and spiritual formation. There is no right way or wrong way to walk the labyrinth. As you follow the winding pathway to the center and back out again, surrender to the journey with an open heart and an open mind. REMEMBERING you are invited to gather your thoughts as you prepare to begin your walk; remember you are blessed. All that we have, all that we are is a blessing from God. If you are waiting in a line of others for your turn to enter the labyrinth, this is a time for literally counting your blessings. RELEASING begins when you enter the labyrinth and ends upon arriving at the labyrinth’s center. This is an opportunity for “letting-go” of whatever distracts you. This is a time for quieting, opening, emptying, and shedding. For some, this happens through a mindful slowing and deepening of their breathing, or the silent repeated reciting of a simple prayer. RECEIVING is a gift at the center of the labyrinth. Having emptied oneself, there is now spaciousness within to receive creative Spirit. Receiving guidance, interior silence, new insight, deeper wisdom, a sense of peace are only a few experiences that can occur on a labyrinth walk. It is diﬀerent for everyone. You may sit or stand in the center as long as you like. Receive what is there for you to receive and accept such as a divine gift. RESOLVE, begins when you leave the center and return on the same path back out of the labyrinth. There are many aspects of this: you can resolve to take a next step in your life, or come to a resolution about something bothering you. Rejuvenation often occurs, or a feeling of rebirth begins. Or, on your way out, you reclaim those responsibilities you set down on the way in, but for which you have new strength to carry them. Often, feelings of strengthening and integration occur. Symbolically, you take back out into the world what you’ve received. This way of using a labyrinth is only a map; it is not the territory. You can allow blessing anywhere on the labyrinth. You can release anywhere on the labyrinth, you can receive anywhere; you can come to resolution anywhere on the labyrinth. The Fours R’s is one way of understanding what can happen while you are walking the labyrinth. Do not hold these too tightly; during your walk you will understand the ﬂow.